That was the criticism levied against the prime minister on Friday by a conservative lawmaker, who took the PM to task for "muzzling strong, principled women" during a debate in the House of Commons. "He asked for strong women, and this is what they look like!" said conservative MP Michelle Rempel, referring to the former justice minister and attorney general Jody Wilson-Raybould, who has accused Trudeau and his cronies of pushing her out of the cabinet after she refused to grant a deferred prosecution agreement to a Quebec-based engineering firm. She then accused Trudeau of being a "fake feminist". "That’s not what a feminist looks like...Every day that he refuses to allow the attorney general to testify and tell her story is another day he’s a fake feminist!" 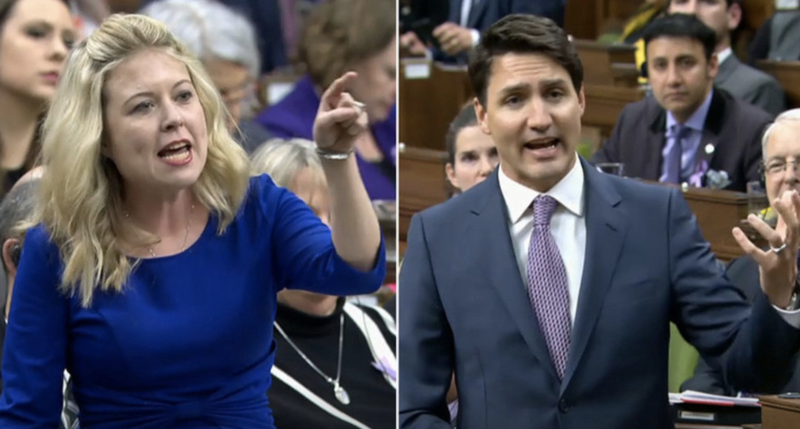 Trudeau was so taken aback by Rempel's tirade, that he apparently forgot which language he should respond in. But Rempel wasn't finished. She then segued to Trudeau's push to quash an investigation into allegations that he once groped a young journalist early in his political career. This from a man who once objected to the continued use of the word "mankind" (suggesting we use "peoplekind" instead). The conservative opposition then tried to summon Wilson-Raybould to appear before the Commons for another hearing (during her last appearance, she shared her account of how the PM and employees in the PM's office and privy council barraged her with demands that she quash the government's pursuit of SNC-Lavalin over charges that the firm bribed Libyan government officials). Wilson-Raybould left the Trudeau cabinet after she was abruptly moved to a different ministerial post - a move that was widely seen as a demotion. Trudeau has acknowledged that he put in a good word on the firm's behalf with Wilson-Raybould, but insists that he always maintained the final decision on the case was hers and hers alone. Fortunately for Canadians who agree with Rempel, it's very possible that Trudeau - who has so far resisted calls to resign - won't be in power much longer, as the scandal has cost Trudeau's liberals the lead in the polls for the October election.